We are looking for more advice requests, so do make sure to send them in and we will address your concerns as a neutral third party! We hope that it will give you a new insight with regards to the problems that you may be facing! But meanwhile, we will be constantly putting up advice content every Wednesday night, so make sure to check back! This week, we will be talking about introversion vs extroversion. The terms “introvert” and “extroverts” should not be new to you. They are one of the easiest personality traits to identify in someone. However, there are a lot of misconceptions with regards to introversion and extroversion. Often, people tend to classify extroverts as people who are outgoing, and introverts as people who are not outgoing. While this may be true in some cases, most of the time, it’s actually inaccurate. So this is the definition that most people are familiar with. A person who is shy and reticent. 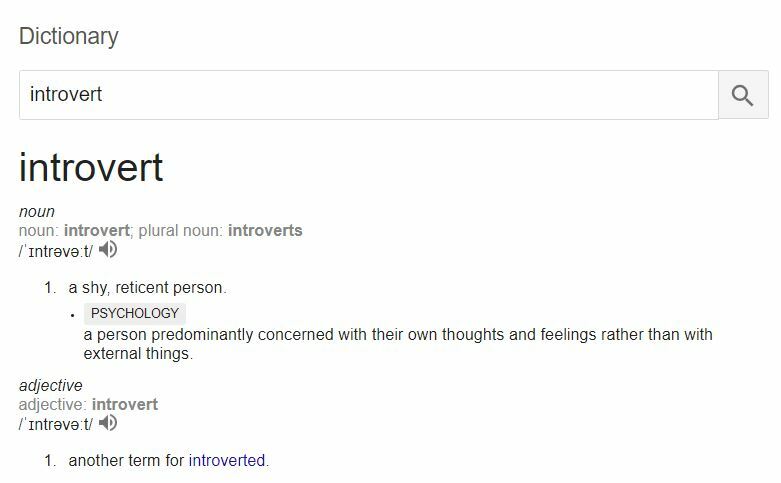 However, in this article, we will be focusing on the Psychology definition, which states that an introvert is “a person predominantly concerned with their own thoughts and feelings rather than with external things”. This definition is accurate to a certain extent, but it misses out one crucial factor. An introvert is someone who expends energy whenever he or she were to interact with someone. However, he or she may not necessary be shy or reticent. It only looks that way because an introvert gets tired out very quickly in social settings, as such he or she will actually conserve energy as much as possible and use it only when necessary. What recharges introverts’ energy is when they alone in the bedroom, reading a book or participating in an activity that allow them to focus on their own thoughts and the process of whichever activity that they are involved in. As such, an introvert will often function better when doing work alone, be it revising for an exam or writing an assignment. They are often also the ones who don’t actively post on social media and prefer to look in from the outside instead. As a general rule of thumb, they aren’t the most comfortable in a big group setting, and would rather watch others have fun. In terms of social interactions, they prefer to meet up on a 1 on 1 basis, or in a small group of 2 – 3. This allows them to thoroughly focus on the person that they’re talking to and that leads to a more meaningful conversation as a result. Because as mentioned above, social interactions expends the energy of an introvert, and if the energy is going to be used up anyway, they would rather that it is for a meaningful purpose. “An outgoing, socially confident person”. Goes without saying, but this is inaccurate. And this time round, there’s no Psychological definition available. As opposed to introverts (obviously), extroverts gain their energy from social interactions. Being cooped up alone in their room with no one to talk to is torturous to them. As such, they are often the ones who are often out and don’t spend much time at home. However, those with close relationships with their family members may spend more time at home talking and interacting with their family instead. The reason why the dictionary definition is inaccurate is because an extrovert may not necessarily be confident. Common sense would tell you that wanting to do something doesn’t mean that you are automatically good at something. 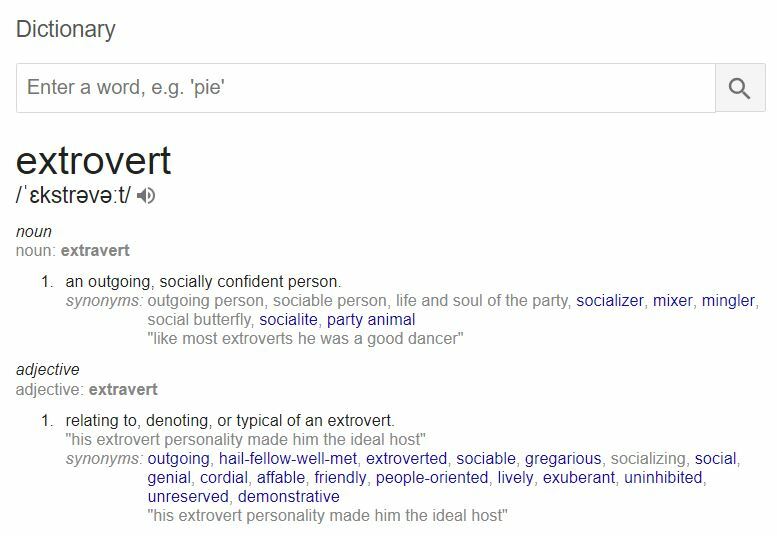 As such, an extrovert may still behave extremely awkward in social settings but he or she still wishes to have a vibrant social life. In terms of working, they find it better to work in groups and bounce off ideas with each other. Hence, they tend to excel in projects and presentations where the situation requires a team effort. However, unlike introverts, extroverts aren’t the most comfortable when they have to deal with their own thoughts. As such, in times of trouble, they are likely to choose to continue meeting up with friends instead of dealing with their own emotions. Contrary to popular belief, introversion and extroversion does not exist in a “either or” state. Just like how something isn’t simply hot or cold, introversion/extroversion actually exists on a spectrum. This is why there are terms such as “outgoing introverts” or “extroverted introverts” popping out nowadays. This is because most of the time, people fall within the middle range of this spectrum. So you might actually know of someone who supposedly identify as an introvert but have a much larger social circle than you, or someone who is an extrovert who only meets with friends once a month or so. Also, while introverts tend to want their peace and quiet and their alone time, they still need social interactions to function. They also crave meaningful connections with friends and loved ones. As such, while dealing with an introvert, it is important to know that sometimes when they reject your invitation to meet up, they are not refusing you, but they simply don’t have the energy at that point in time. Likewise, if you’re in a relationship with an extrovert, it is important for you to allow him or her to retain his/her social life as this is simply a part of him/her, and it does not mean that spending time with you is boring. I will talk about this in further details in another article, but humans simply need more understanding between one another to get along. No one is exactly the same as the other. While it is not an immediate instinct to put yourself in the other person’s shoes, it is definitely a habit that everyone should learn to cultivate. When you are able to put yourself in the other person’s shoes, or in other words, be able to emphatise with others, you will find that you will take less things personally. As a result, you will probably experience less fluctuations in your emotions than you normally would, and this will also improve your interpersonal relations with others. Pretty much a win-win situation, I would say. But before you actually can do that, it is important to take some time to understand human psychology. Well, I hope that this article has provided you with a tiny insight onto human psychology. Personally, as someone who has studied psychology, it helps me with understanding people’s behaviour and the human psyche. And while I’ll love to put this knowledge to use by answering any queries anyone of you might have, I will also spend time putting up articles to share certain psychology knowledge with you here. Also, if you have any events that you wish for us to write an editorial coverage, feel free to contact myself at cayden@noc.com.sg!